Cathryn: Hello, and welcome to today’s webinar, “Life After Launch: How to make change a success.” My name is Cathryn Newbery, and I’m CIPHR’S content marketing editor. With me today is Ian Hogg, Chairman of Workforce Management Solutions Provider, ShopWorks. Welcome, Ian. It’s great to have you with us today. Ian: Thanks for having me, Cathryn. Cathryn: Okay. 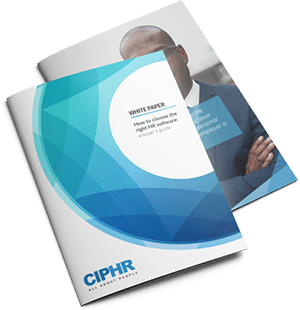 If you don’t know CIPHR, we are a leading UK developer of HR recruitment and learning software that helps organisations to attract, engage and retain their workforces more effectively. Our solutions cover the entire employee lifecycle, from attraction and recruitment through to engagement, development, management, rewards, and retention. If you’d like to find out more about CIPHR’s solutions, you can opt-in to hear from us via the survey at the end of the webinar or email us using the address on your screen now. ShopWorks is one of our strategic CIPHR Connect partners. It specializes in workforce management solutions in the hospitality, leisure, retail and service sectors. Today, Ian will be sharing ShopWorks expertise in digital transformation with lessons and tips that are applicable for organisation of all shapes, sizes, and sectors. So, here’s the agenda for today. This webinar should last around 45 minutes with about 30 minutes from us. And then time at the end to answer your questions. Do send in your questions, comments, and queries during the broadcast. You should see a small control panel on your screen. Hit the orange arrow button to open the messaging window and we’ll pick up your question. So, before I hand over to Ian, I’d like to start today’s broadcast with a quick poll. Are you currently involved in a digital transformation or change management project? So just a simple yes or no answer there. Ian, what you’re expecting our audience position to be on this? Ian: I would guess that because people have said they want to come and listen that a high percentage are involved in some sort of change management and probably digital transformation. Cathryn: Okay, great. And I can see lots of you have voted now. Thank you. I’m going to close that and share the results on screen. So, Ian, your prediction is right. Actually, two-thirds of you say that you are currently involved in a digital transformation or change management project. So, you’re in the right place, which is brilliant. And a third of you who aren’t currently involved in one, I’m assuming that maybe you will be involved in one soon or perhaps you just closed a project and want to kind of find out about some learnings that you could apply to your next one. So, with those points in mind, I’m going to hand over to Ian now. He’s going to take us through the current challenges of digital transformation projects and how to overcome them. Ian: Hi. Thanks, Cathryn. Yeah. I thought I’d start with a little bit of a definition really because you quite often hear the words like digital transformation bandied around and change management. And, quite often we find people don’t really know the difference between the two, or even what digital transformation is. So, you can see on the screen, the change management is really a broad umbrella term that talks about any real major organisational change in the business, and digital transformation is a sort of subset which uses technology in novel ways to solve traditional problems. As you could expect, there’s a big overlap between the two. We at ShopWorks believe that we are doing digital transformation projects. And I thought I also wanted to just discuss why we think we’re qualified to even give this webinar. So we do lots of digital transformation projects with retailers, leisure organisations and our hospitality firms. We do about a dozen a year. Quite often we have five on the go at any one time. And the nature of the projects is that customers try and get all of their staff off of paper-based or spreadsheet-based processes onto a cloud-based workforce management system. And some of our customers have got, you know, in the tens of thousands of staff that needs to be moved over. So, we definitely feel that that’s a digital transformation project. And we’ve done quite a few. So, let’s start with the sort of challenges, then. So, we find that we get quite a few sorts of sources of resistance, as we call them. So, we you know, whenever we’re putting a workforce management system into a company, and then they’re normally multi-site retailers or hospitality, or leisure centres, these are the challenges we come up against with resistance. So, the first one is just a new system, and that, as I’m sure you know, creates resistance on its own. Where it starts to get a bit more complex for us is that we’re asking, often asking people to change their responsibilities, and I think you’ll find this is true in a lot of digital transformation. The tools allow management to delegate tasks on a self-service manner, down to the lowest level of, lowest common denominator of a business. So, instead of doing something centrally or as an area manager, quite often it will get transferred down to a store level, and that changes the responsibilities of the manager of the store and creates resistance. It would generate new processes. What, you know, digital transformation is all about changing one process with another and using software to that. And again, not everybody likes that change. But where it sort of really starts to sort of get some resistance is in the fact that it’s much, it creates a lot of more accountability for the people that have been asked to do this work, and transparency. So, by having the data and the tools and using, you know, using software to manage these processes, we find that the store managers in our case, but read across to your own projects, but the store managers in our case all of a sudden, much more accountable, it’s much more visible if they don’t take action or they don’t generate results. And, you find that the changing process quite often highlights, let’s just call it bad practice, but sometimes it’s worse than that, and people do look to protect themselves against it. But probably the final bit of resistance is all this transparency and accountability actually gives, requires managers to manage. So, I’m not talking about managing the software and using the functionality on the software, I’m talking about the fact that once data is available that bad practice is happening, managers of stores in our case are expected to do something about it, challenge bad practice and encourage best practice. And that can be the biggest source of resistance to some of these changes. And I’m trying not to make this too sort of focused on us. But you can imagine on a workforce management solution, if the biometrics is telling the manager that such and such was late, and that they need to have their pay docked by 20 minutes because they didn’t turn up on time, all of a sudden, they can’t just hide behind filling out a piece of paper and pretending they were there on time, they actually have to challenge that person, and take responsibility for the action. So, if we look at the they’re the sort of sources of resistance. So, when we approach a sort of workforce management project, and I believe these read across a lot of digital transformation tasks, the first sort of areas we get challenges from on a sort of group level, understanding of the task. Okay. That’s the number one thing for me, that a lot of people will buy software and assume that this software will magically solve all their problems. And those of you that involved in these sorts of projects probably quickly work out that it’s not that easy. And the company needs to understand, or the organisation needs to understand that actually is in the change management project, it’s not in a software rollout project. And that is one of the biggest things we have to put across. Another challenge we get is buy in all levels. We talked about the resistance at certainly the sort of store-level for us and your junior and middle management, but we often get situations where somebody in head office buys this software, or the board dictate that they want to implement something, appoint a project manager and tell them to get on with it. But if the board and the senior management don’t stay involved, the project pretty much unravels quickly, you know, and that’s a challenge to us. Consistent usages of standards. With change management and digital transformation, we’re quite often involved in changing people’s policies, that, we talked about process, and there needs to be a sort of consistent usage and communication of that across the board. So, for instance, is the manager authorized to dock somebody 20 minutes of pay? Okay. What if it’s two hours? Do they need senior, a higher level of authorization? And one of the things we find is that organisations, if they don’t gear up to make those decisions, implement the processes and communicate them, then we get inconsistent use, and poorly rolled out results. Finally, focus. The sort of problem from number one, understanding of the task, quite often people will think it’s just a software roll out, they don’t allocate additional resource or time to the managers of the stores to take on the extra responsibility. It’s just expected to be part of their role, and on top of their existing responsibilities. And, likewise, if the senior management aren’t focused, so this sort of overlaps with number one on here, we do get problems. So, they’re the four biggest areas of challenge we get on a group level. I think we can do a poll now. Cathryn: Yes, that’s right. We’re going to do our second poll now. So, Ian’s just spun you through the biggest challenge that he thinks are associated with digital transformation. Which ones are those are you running into most often? And check all that apply there. And if none of those four are ones that you’ve encountered, please check the fifth option or other challenge. And if you want to tell us what those other challenges are by sending in a message using the chat box, and we can revisit those. Ian, you’ve talked about those four common challenges. Which one do you encounter most often, or do you see as the biggest obstacle that organisations you work with face? Ian: Definitely the first one, understanding of the task. We often get one or two people in an organisation that understand it, but it needs to be the whole organisation. And somebody might buy some software because they’re looking for certain benefits but haven’t really worked out that they’ve got to put a lot of work in to deliver those benefits. A phrase we often use is, “We’re just software geeks. You need to run your own business. All we can do to give you the software.” But you’d be surprised how many people haven’t worked that out. Cathryn: Yeah, fair enough. Okay. I’m going to close the results now and share them with you on screen. So, surprisingly, actually, most common challenge among our audience today is buy-in at all levels, with 82% of people cited as an issue. But I think that does link quite closely to what you were saying, Ian, around the understanding of the task and getting that understanding at all levels. And then also consistent usage and standards rated as two-thirds of you as being a problem. Are you kind of surprised by these results there? Ian: We see, maybe I see it as a supplier and some of the people are seeing it as operators of their own business. We go into a number of different companies where we’ve effectively sold some software. And, so, maybe I have a slightly biased view on that one. But it doesn’t surprise me that buy-in and usage and standards is one that is not obvious. But when you go and try it, and then those aren’t implemented, it does cause a lot of problems. Cathryn: Sure. Absolutely. Okay. I’m going to hide those results now and pass it back to Ian for the rest of the presentation. Ian: Okay. So, what are the solutions? Well, it wouldn’t surprise you that the solutions are pretty much the opposite to the challenges. So, lead from the top, I suppose that covers both the buy-in at all levels and then the understanding of the task for me. Show results. Okay. So this almost could be the number one sort of solution. It was pretty neck and neck between one and two. But what we’ve found is that if you don’t show results along the way, and I mean consistently, lots of them and lots of data of what benefit is being derived from the project, people don’t buy into it, particularly if you’ve got the problem that we highlighted early, where not really enough resources have been allocated to make the project happen. So, showing results gets buy-in and encourages everybody to keep on with the project. And you actually could say, if you can’t show the results, and they don’t appear to be coming, it helps you decide whether actually this project is worth doing or whether it’s time to pull out. But let’s assume it is showing the results to keeps it going forward. And then this one, focused on outcomes, not functionality. So, again, this is about the difference between doing a software rollout and a change management project. So, for us, functionality is how to build a router, how to run reports, how to confirm the daily worklog. Whereas, the outcomes are saving 2% of staff costs, making enough, making sure you’ve got enough people serving coffee at breakfast time when its peak demands. And those outcomes are what our software does, or what our software, if it’s correctly implemented, does. And so, we spend a lot of time trying to focus on the benefits, and then measuring those and shine those back on the results. And if we function on, if we focus on functionality, or allow the customer to focus on it, particularly at store level, people get sort of worried about the minutiae of whether it’s actually this bit’s easier to use or whether the report’s got exactly that bit of data in. And, again, that’s a sort of loss of focus. And finally, this one, presumably, everybody knows this. This is probably most people’s number one is, if you’re trying to convince sometimes tens of thousands of people to work under a new process, if you don’t engage with them and communicate with them and do that regularly, then you’re going to struggle. So, taking that into account is a big part of the likelihood of success. Okay. And we just want to focus on that one, really. So, with engagement, we do a 3-month implementation plan for our software. But actually, to train on the software, and for me, this bullet point explains it all. It only takes four hours to do the functional training. And, to be honest, some people got it after 20 minutes in a board and have already worked it out. And so, you have to think, why does it take three months to get something fully rolled out and properly implemented? And that’s because the functional element of the training is quite simple, and, actually, all the other stuff we talked about overcoming resistance, getting processes in place, setting SLA standards internally, making decisions, that’s what takes the time. So, one of the…one of our key lessons we’ve learned is, we don’t try and roll out everything all at once. And I know this isn’t rocket science, but we would nearly always do a trial with maybe 10 or 12 stores on a big rollout. And the reason we do that is just to learn lessons. And to get a small team that have bought into the rollout, understand more than the rest of the organisation, and they effectively become the next bullet point, you’re, part of your steering committee, alongside the sort of project management and senior management who are representing all levels of the business and helping you make those decisions. So, if we go back to sort of implementing the consistent standards, one of the things that is definitely an issue is, if you let those standards, if, for instance, everybody has decided that they want to get the rotas or the staff schedules built by the previous Wednesday, the steering committee agrees that’s a sensible time, it gets communicated and that becomes the standards. And then it gets measured against that. And then, a big part of it is, of having engagement for these workshops. So, again, not functional training outcome-based, we would run a workshop for senior managers in the business, where we would be looking to take the data and work, out you know, what are our objectives? Are we achieving it? How many people did we have serving coffee at breakfast? Where they enough? What, were we above or below budget on the staff costs? Did we authorize too much overtime? And what solutions we can put in place to try and improve on those KPIs and make the…we get closer to the outcomes we were trying to achieve. We normally do that at senior manager level first and take feedback from that before we then roll those workshops out with a slightly different flavour and with some more decisions made to sort of area and venue managers. And that’s normally done… we would normally run the first workshop, and then the second ones we just support, and we expect that the company to roll those out. And then finally, the real-time live KPIs. So, this is one of the perks of being cloud-based. All the data is online. We know whether shop A was above or below its overtime budget yesterday, and we can communicate that to them in real time, and we communicate that to their area manager and regional manager on a consolidated basis, on a weekly basis. And, we find that those KPIs are pretty essential to driving the change and keeping engagement. I just want to focus on that one a little bit. There’s a quote here from a management consultant, Mr. Drucker, “If you can’t measure it, you can’t improve it.” And that is definitely, if it’s not our company motto, it ought to be. Okay. And, yeah. And just going back on some of the data. So, we publish KPIs daily. We don’t start publishing the KPIs until we have done the workshops. So, an important part for us in the rollout project is, we train the staff, we get them to use it without publishing the KPIs. That generates some real data and some real use cases. We then take the staff through those in the workshops, and say to them, “From now on, this is how you’re going to meet to manage it, and you’re going to get these KPIs daily. And by the way, so is your area manager, and so is the finance director.” And that’s the sort of key way we get the data into the business. A big part of is also is we share best practice. And because we’ve done this a few times before, we can give sort of network-wide, like across tens of thousands of stores, we know what good performance looks like and what a bad performance looks like. So, we, as well as sharing best practice internally within the target company, we’ll share it with, what we would call sort of network-wide data. And finally, the KPIs need to mapped back to the original objective. So, all the way through the project we’re tracking to see, normally the targets are around cost savings, efficiency, making sure you’ve got enough staff on at the right times, and we will be tracking the KPIs back to prove they’re achieving that. And again, going back to a point I made previously, if we’re not doing that, what’s the point in doing the rollout in the first place? We’re not achieving the objectives, we’ve just put everybody to a whole load of work and cost for no real benefit. And, just to sort of highlight the sort of virtuous circle that is, that KPIs generate is, they highlight results, results get the attention of senior management. They also, they focus minds on the outcomes, not the functionality. That improves the performance. The KPIs highlight the improvement, and it becomes a virtuous circle. And, if we find that it’s a successful route to digital transformation on our products. Now, hopefully, I haven’t been too focused just on workforce management, and staff scheduling. We’d like to think that a lot of these lessons read across to any digital transformation project. But that’s all I had to say, other than being open for questions really. Cathryn: Thank you so much, Ian. That was really fascinating. Hopefully you, our audience have learned a lot from Ian’s thoughts on best practices there and you have lots of questions for him. Do send them in using the little toolbox you might see on your screen. Just pop open the orange arrow to open the Q&A window. I have some questions to kick us off. Ian, do you have any metrics about how successful your approach to change management and digital transformation is in the companies that you’re working with? Ian: Yeah, it’s a bit binary, really. So, we have…when we come to the end of the trial element, if we all decide to go ahead, we pretty much have 100% record of successful rollout. And, if we don’t all decide to go ahead, it’s nearly always, you know, my number one challenge that I put up about understanding what it is they’re getting involved in and buy in at the most senior level, it falls apart on those sorts of issues. And, if they don’t understand what they’re getting involved in, and they haven’t probably bought into it, then we don’t want to get involved in it, and we would normally politely encourage to the plug gets pulled. That second sort of going for problems about, you know, standards and things like that, they come through the evolution of the trial and the rollouts, and they tend to solve themselves if you’re sharing the data. They can be a challenge, but they don’t, they don’t stop success, whereas, you know quite early on whether you’re going to succeed or fail based on engagement from the senior management. Cathryn: Sure, okay. Thank you. How open do you find that companies are to this transformation management approach? Ian: Again, it’s a bit binary, really. So, we’ve sold people along the line that that’s what we intend to come in and do. We’ve only got one way of rolling out our product. We give a free trial to a small number of units, gets us through the first step, then people decide they want to do it. So, most of the, and we’re in retail, leisure and hospitality. And if you read anything in the press about those sectors, they’re under pressure from business rates, national living wage, all sorts of other things. So, they’ve got an incentive to look at solutions like this if they’re still on paper. So, I suppose, in a roundabout way is we have a high percentage of the people we come across are very keen to make it work. It still surprises me how many companies have can’t see the wood for the trees and aren’t capable of grasping it and doing a project like this. Cathryn: Okay, fair enough. That actually takes me really nicely to my next question is, in your experience, Ian, is digital change getting harder or easier for HR to manage? Ian: I think it’s probably getting easier. I think the cloud helps. I think if you’re trying to do some of these solutions with on-premises software, it would be much harder. I think all sorts of tools like this, webinars and conference calls and modern communications helps. I think the generation of, certainly in the sector we’re in where a lot of the employees that are going to use this stuff, they’ve had years now of using social media apps, PCs, web. So, the technology isn’t a…shouldn’t be a hurdle and a barrier now. And actually, part of the thing that my little presentation was, it’s not about the functionality in the technology, it’s about the change management. So, the fact that nowadays you don’t have to worry too much about the tech, and it’s all cloud-based and staff are used to using it, and you can train them in a few hours, does make quite a lot of elements of the project easier. Cathryn: But that’s good news and reassuring. And, you talked a bit about using software in a pilot group. What should people be considering when deciding who that, who is appropriate to include in that pilot group in particular locations or different groups of workers and managers? Ian: We’ve got two sort of approaches that get discussed. One of them is, give me a group, give me a mix, give me some early adopters, a miserable old dog like me that’s going to complain and moan, and give me somebody in the middle. And, let’s see if we can get it rolled out to all of those. And then the other approach is, let’s get some just early adopters and champions that are keen on the project, and keen to move forward in the business. And got pros and cons on both approaches. That if you get the sort of early adopters only, you don’t always highlight some of the challenges and resistance that’s going to come because they just get on with it and do it. But what you do do is, you get quick and good feedback, and it’s definitely the quickest route because you can establish those processes with intelligent, hardworking people, and you’ve got a good chance that they are the ones that are good to roll out. If you go the other route, where you have a mix and match and make sure you got technophobes in there and anybody else, then you really have proven all of the solutions. I think I’m balanced, and this is personal preference. I actually prefer the, let’s gets with the early adopters, make the trial a success, and share that with it with other people. And that might be my bias just as a supplier because it increases my chances of getting a positive outcome. Cathryn: Yeah. Absolutely. No, that’s a fair comment. I think there’s definitely merits to both. So, something to consider when planning your next digital change project. And we have a question from Larry, you asked, what was the general feedback from management regarding taking on a new system? Ian: Well, again, it sort of depends. So, the slide I put up about resistance is, we do get a lot of resistance from store managers or people that are being put, asked to sort of take on new responsibilities for the first time, but not all of them. And so you’ll find that half of them will go, “This is great. I can actually manage the business now and move forwards.” And I think, so if we were to go down different sort of levels in the organisation, senior management, those that get involved in the project and understand what it can deliver are nearly always enthusiastic. Okay? And our trick is to make sure as many of those are involved. Middle management, probably the most enthusiastic for us because they’re the ones that are currently doing all, you know, dealing with all of the problems of bits of paper and spreadsheets, and report data, and complaint some staff when they don’t get paid the correct amount, and things like that. And then, if we go down to this, in our case, down to the sort of store manager level, it’s probably, I’d like to think 60-40 in our favour, where they’re positive and supportive. But once it gets rolled out, and it becomes sort of just part of the daily process and people are used to it, those sort of acceptance rates go much higher, and pretty much everybody gets on board, and it becomes the norm. Cathryn: Okay, fantastic. Thanks, Ian. And Larry, I hope that answers your question for you. I have another one here. So, you’ve talked a little bit about how KPIs can help achieve digital change. Can you talk about, a little bit about what would organisations need to consider when setting their KPIs? Ian: So, yeah, I think it comes back to the objectives. So, for us, we’ve done quite a few of these so the KPIs have evolved. So, and our reports that we run, it becomes the same set of KPIs for every customer because we’ve done it a few times before, and then we refine that process, update the reports, and then everybody gets sent that report on a daily basis. But what they should do is, if you’re doing it for the first time without the sort of benefit of a few previous attempts is, they should be going back to the objectives, because the whole idea for the KPIs is that you are, you set some objectives, which in our case might be to save money and reduce the staff costs by 3%. And we would then break down, what are the things that contribute towards that 3% saving? And let’s say that’s excessive use of overtime, failure to correct people that are late, overstaffing during quiet periods, and using expensive staff when cheaper staff are available. So, our KPIs would measure those, measure all of those and against targets, and we would share that with, like we said, all of the people involved. And when you start off measuring those, in our case, it normally highlights the inefficiencies of the previous system, which was normally paper-based, or spreadsheet-based. The KPIs indicate that there’s a problem. The process of the three months, is then to say, “Okay, what innovative solutions can we do to reduce the…we rely on some over time,” and some of those to do with the software, but a lot of them are to do with just management and operational decisions. Did I answer the question? Cathryn: Yeah, I think so. No, that’s really helpful. Thanks, Ian. I have a question here from Heather. She asks, as a supplier, what information do you need from the business before embarking on starting a project? Ian: Okay. So we have to get all GDPRed up on this one because we need personal data from staff. So, if we were going to… This is very ShopWorks-specific, but we build a platform, put on it all of the employee data. So, let’s say we’re doing a trial for 10 stores, and they were called, they were the southeast London region, we get the names, the addresses of those 10 stores, we get all the staff from them, those 10 stores input into the system, and we get all of their pay and other details in so that we know whether they, you know, how much to pay. So one of our things our system does these check things against budget. So, before somebody approves a rota, it will calculate what that rota costs and check whether it’s above or below budget. So that’s one of our KPIs. “Were you above or below budget last week?” And so, in order to do that, we need quite a lot of personal information. So the first thing you have to do is a GDPR review with the customer, sign some bits of paper and get some personal data. Cathryn: Okay. Great. Just to note, that if you’re using CIPHR and you want to implement ShopWorks, there is an integration between CIPHR and ShopWorks? Ian: Yeah, absolutely. So, that’s a very good point. If they’re already a CIPHR customer, we switch on that integration, and instead of having to import that data manually, we would just…it would just be populated automatically in ShopWorks. And also, any pointers and leavers within that period of the trial are populated pretty quickly or, you know, end of day. Cathryn: And that kind of removes some of the hassle of like, taking your data card, putting it into the other system. We know that GDPR’s taken care of because it’s all safe and secure within the CIPHR, and it’s been secured [inaudible 00:31:24]. Cathryn: Yeah. And so it’s really nice if you are able to integrate your chosen HR software with whatever other system you’re looking to implement because it just takes away a very different hassle. Ian: Yeah, we’ve not covered that, because I was trying not to be sort of specific about ShopWorks on this and just try and talk about digital transformation. But, yeah, we never do a solution where there isn’t an integration really between HR and workforce management, and then workforce management and payroll. They’re three peas in a pod nowadays for this sort of, these, certainly, our customer base. Cathryn: Yeah, absolutely. Okay, thanks Ian for your expertise. I think that’s all we have time for today. Thank you to you, our audience, for joining us. Really appreciate you being with us this morning. If you want to find out more about ShopWorks workforce management solutions, or CIPHR’s HR and recruitment software, you can either visit ShopWorks website that’s on your screen now, or you can check the relevant option on your screen, and there’s a little survey that will come up at the end of the webinar. Just opt in there and someone will get back to you. Thanks again for joining us today. We hope you found it useful and informative. And we hope to see you at another webinar again soon. Thank you. Bye. Ian Hogg from workforce management solutions provider Shopworks joins CIPHR host Cathryn Newbery to dissect the reasons why digital change can fail, and how to make the most of your new software after launch.